The day started with us making our way across to Mutford Lock and thuy were able to lock us through and straight under the railway swing bridge in one operation, which was very helpful of them. I somewhat spoilt it by over-shooting the Haven Marina and having to turn back but we ended up safely moored on the hammer-head of pontoon D and there were very comfortable. 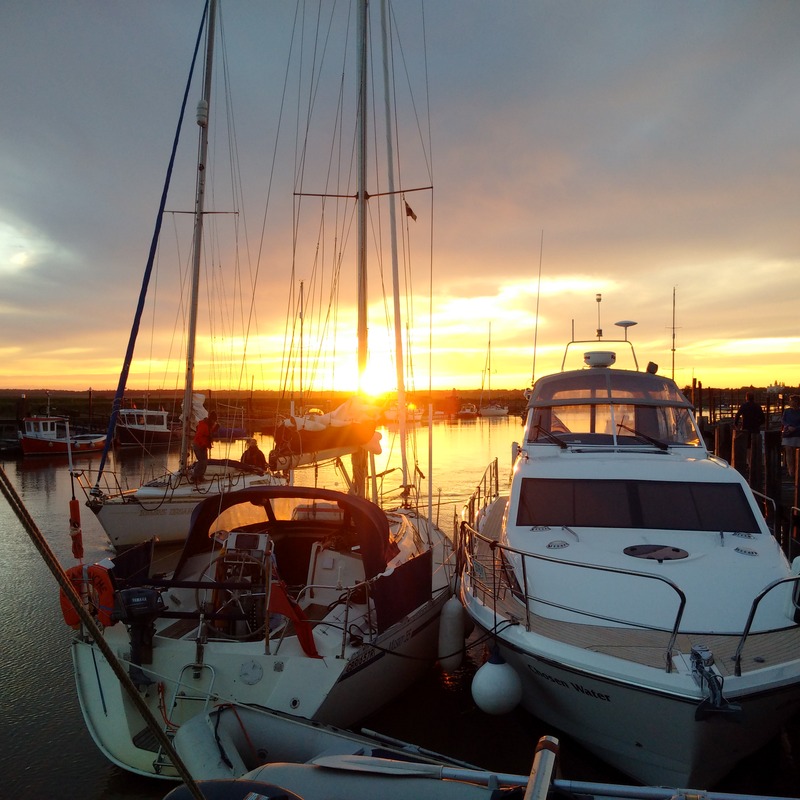 Ashore to pay and book a restaurant for this evening and then the afternoon working on charts and waypoints for our passage to Woodbridge Tide Mill on Sunday, when the weather will again be good. The evening working and writing and thankfully taking advantage of the Marina WiFi to update my journal and get the necessary weather and other information we needed. We had heard from our Broom colleagues that they had changed their plans and were cruising direct to Woodbridge today and possibly calling in to Southwold on the way back but we had booked the moorings at both places according to the former plan and a direct passage to Woodbridge would have had us arriving very late on the tide and so we let them go alone. The other consideration was that we were making our way down the coast and so cruising directly to Woodbridge would mean not calling in at Southwold at all and I had never been in there. 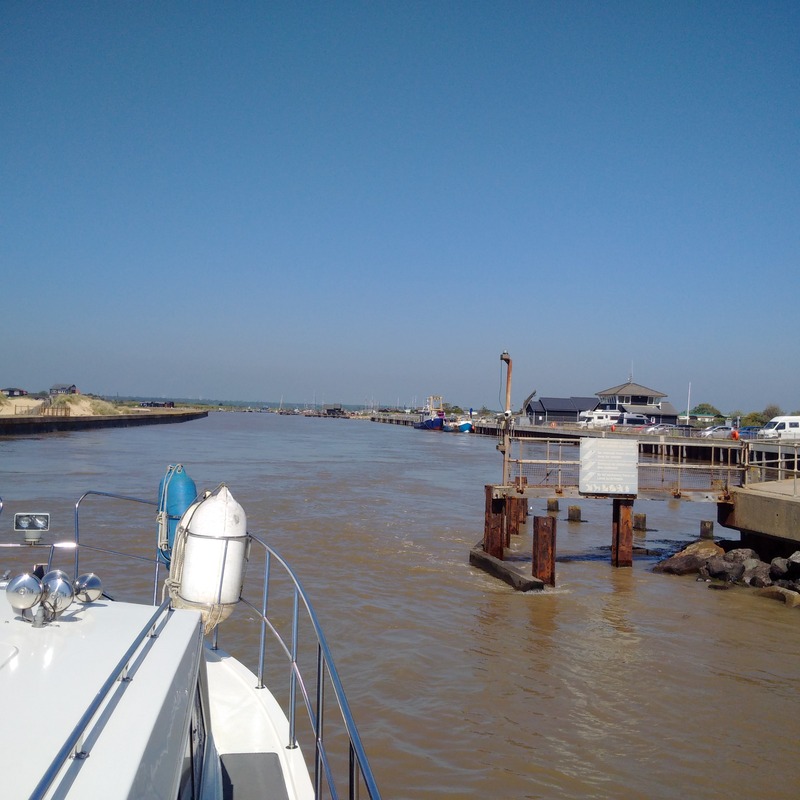 Our passage today took us out of Lowestoft on the 9.30am bridge lift and then allowed for a 10knot leisurely cruise down the coast for an hour or so and then entry half an hour before High Water and, for a new port on a Spring Tide, that suited us just fine. It was a little breezier than the last few days and it was onshore from the east, but it was only 10-11 knots and very manageable giving slight seas and so the passage was a joy. 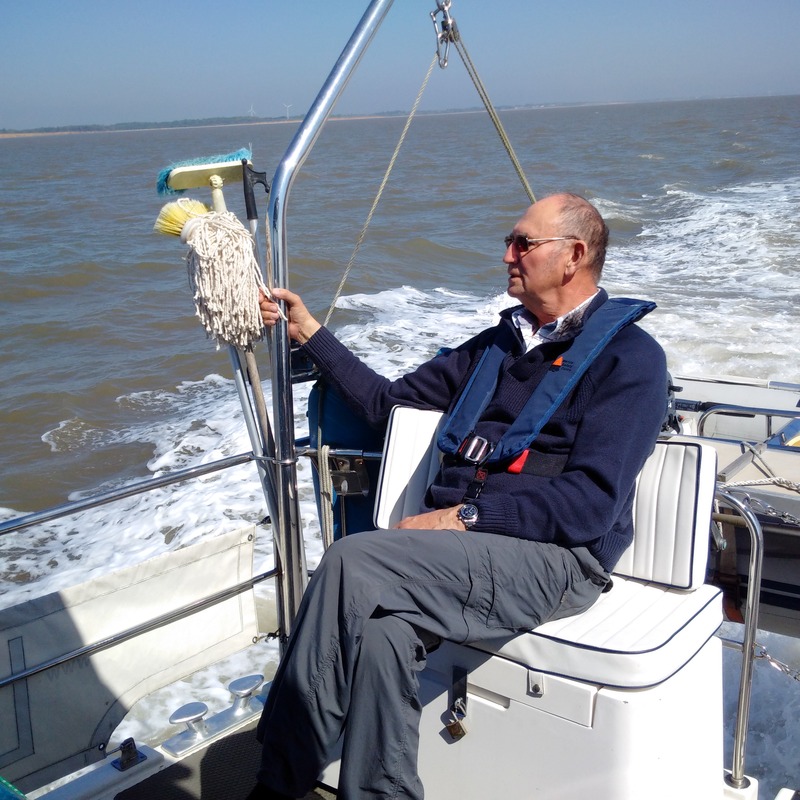 We approached Southwold Harbour entrance on the 320 bearing recommended and our waypoints took us right there. I kept sharp right and close in around ‘The Knuckle’ and then made my way upstream with a 2kn following tide, turning without trouble and coming in to where the harbourmaster was standing and directing me on VHF. He had allowed me on to the ‘pub moorings’ on the true left bank, which had more depth as well as electricity and water, for the new pontoons moorings on the right bank were shoal on Spring Tides. The only downside is that the quay timers are vertical but he had plenty planks on ropes that we were welcome to use horizontally against fenders to help Lady Martina stand-off. It took us a while to get all of the ropes, planks and fenders adjusted but we ended up with two planks, one each correctly positioned for the flood and ebb flows, and then we used the water to wash down the boat and fill the tanks.